What's new: Scroll down the blog post for the 37th Marchand Open tournament flyer. 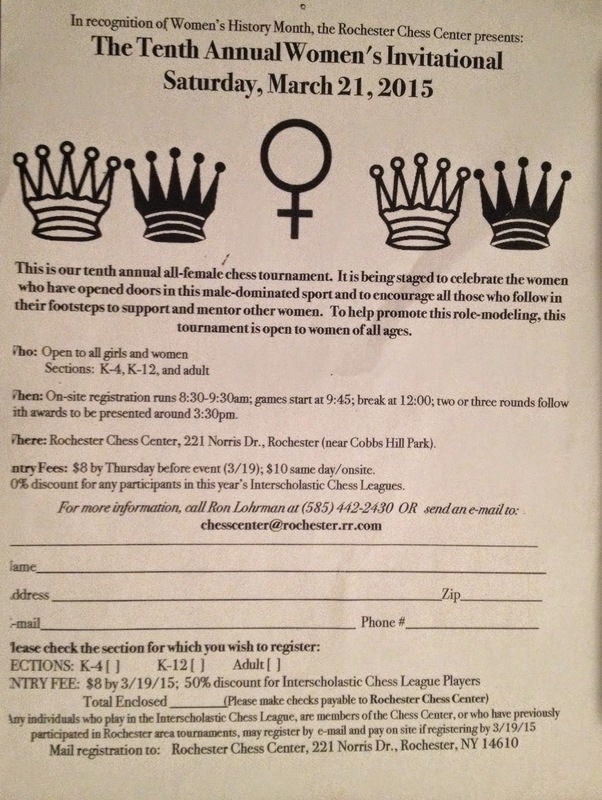 Scroll down the blog post for the 10th Annual Women's Invitational Chess tournament flyer. At the end of this blog post, the Chess Center's Blitz Rules and Tiebreaker methods are reprinted here for the "convenience" of TDs, players and other chess clubs. There are also have several Kids tournaments coming up at schools and at the Chili library... details below. Long-time CCCR member Kenn Scullin joined us for chess Wednesday night. 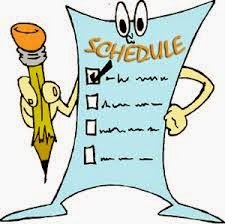 over a period of five separate Club meeting nights between Oct. 29, 2014 and Sept. 30, 2015. This is a members-only tournament. 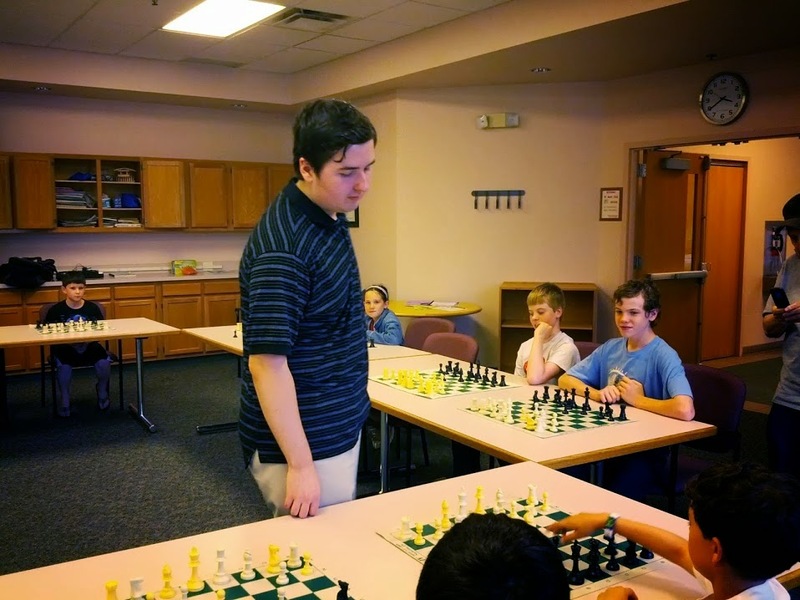 Rochester Chess Center Chess Camps - Kids have fun! (G/90d5 for boards 2 and below. G/90+30 for board 1). Wednesdays: Community Chess Club or Rochester games at the Rochester Chess Center. Registration: 6:45pm-7:15pm. Games begin at 7:30pm. $5 non-members. $3 members. (G/80d5). Chili Chess Club meets the 2nd and 4th Thursdays 3:00-5:00. Check the Chili Library web site for dates and information - Organized by Adam DeSantis and Fred Mellender. Every Friday: Friday Night Blitz Chess at the Rochester Chess Center. 7pm to 9:30pm. $6 entry fee, format determined by # of entries. (G/5d0). Every Saturday: Youth tournament 10am-1pm G/30d5 and Adult tournament (G/60d5) 2pm at the Rochester Chess Center - Register by 1:45pm. at the Rochester Chess Center - Register by 1:45pm. Unless there is a scholastic tournament, there is a Saturday Kids tournament every Saturday from 10am-1pm at the Rochester Chess Center. There is also a Saturday Kids tournament on Jan 24th for folks who cannot make it to the tournament in Geneva. Call 585-442-2430 for details. The Winter Chess League started on Monday Jan. 5th. There are two openings for players with ratings under 1300. Board 1 is dual-rated (USCF and FIDE) and follows the FIDE Laws of Chess. Other board levels are USCF-rated and follow the USCF rules. 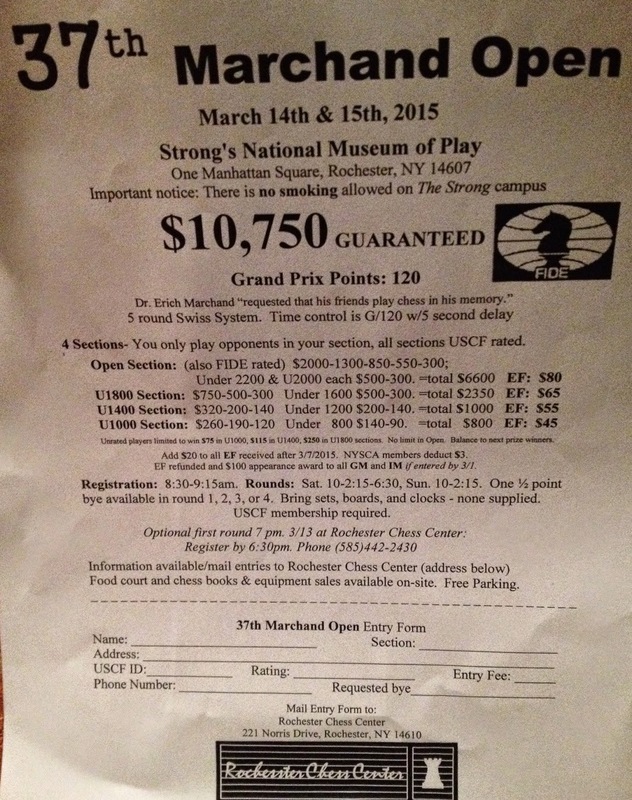 Ron Lohrman is running Sunday afternoon USCF-rated tournaments! These consist of quads (4 player round robin) and 2-player games. The games begin at 2pm. Pre-register by 1:45pm, or call ahead at 585-442-2430. The next kids tournament at the Chili library is January 22nd! USCF Chess Master Matt Slomski will be giving a Chess Simul! This is an unrated, free event, and no chess membership is required to participate! Sponsored by the Chili Library. Tournament directors: Fred Fred Mellender and Adam DeSantis. This photo is from a previous simul by Matt Slomski. Update Jan. 23rd: The players and spectators thoroughly enjoyed playing the chess simultaneous with chess expert Matt Slomski on January 2nd. Matt won all his games. As players continued to arrive during the Chili Library chess club event, Matt welcomed new opponents in the simultaneous. Matt is a fine player and exemplifies true good sportsmanship. The special event to promote chess for children was arranged by Fred Mellender and Adam DeSantis. The event was sponsored by the Chili Library. Chess Simultaneous Event with Matt Slomski. Photo taken Jan. 22, 2014. "Garry Kasparov humbled by Westminster peer, but what did the chess great miss?" 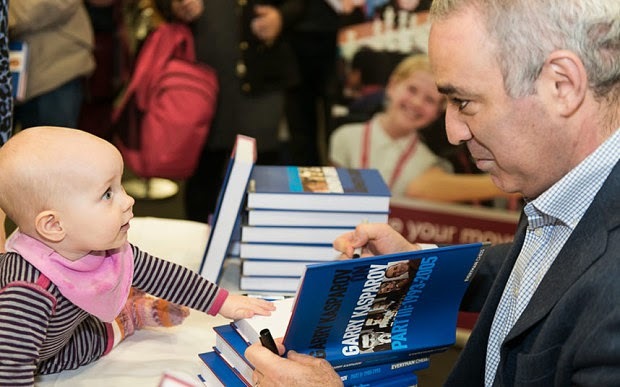 Chess Champ Garry Kasparov at a recent book signing. Photo is the property of the Telegraph Newspaper in London, England. In bad weather, please call the chess center at 585-442-2430 and check this blog for tournament cancellations. The Chess Center runs a weekly Adult tournament at the Rochester Chess Center. Register by 1:45pm. Call ahead to register at 585-442-2430.
for his perfect 3.0 score against strong competition on Saturday, Jan. 10th! Abe is also a former CCCR Champion and two-time Deaf chess champion. 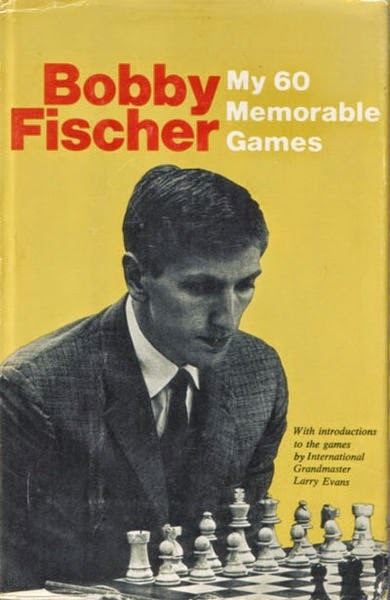 A great collection of games... available at the Chess Center. Apr. 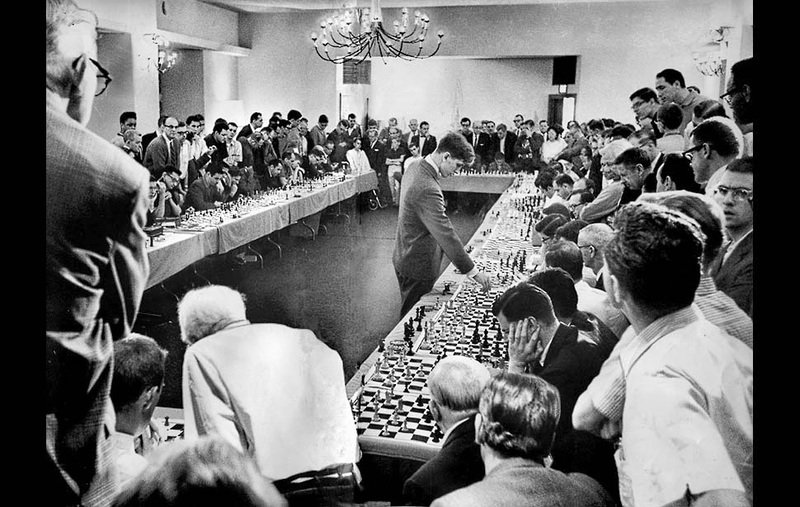 12, 1964: U.S. chess champion Bobby Fischer makes move during an exhibition match against 50 players in the Knickerbocker Hotel in Hollywood. Courtesy of the LA Times. New 6th Edition USCF Rule Book: All TDs of the Community Chess Club of Rochester and the Rochester Chess Center now have the latest 6th Edition copy of the USCF rule book. This replaces the 5th Edition. A copy of the 6th Edition USCF rule book reference copy is at the Chess Center and is available by request. All players are encourages to purchase either a hard copy or electronic copy. Barnes and Noble is one of the booksellers that offers them for a discount. FIDE Laws of Chess: For FIDE-rated games, the Chess Center has a copy of the Laws of Chess in a notebook for easy reference. This mainly applies to Monday night league board #1 and the Open section of the Marchand Open. USCF Rule 21E The Playing Director: The USCF has confirmed that it is OK for the Chief TD to play in small events and at the same time also be the chief tournament director. 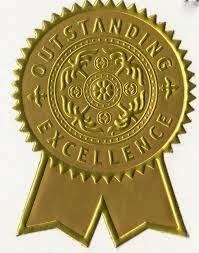 This applies to both affiliates for USCF and dual rated USCF-FIDE events.